Throughout my career, I have been engaged in various levels of office design, from 500 to 10,000 square feet. There simply aren’t a plethora of businesses that operate without an office in one form or another. While the dialogue of important features varies per project, the basic needs of the people who occupy the spaces remain nearly the same. The current trend is to open up offices, tear down walls and create a synergy between co-workers. Is this the best solution? In this article, I will examine open versus private office environments, pro’s and cons. Then I will make a scientific hypothesis on the best office environment. 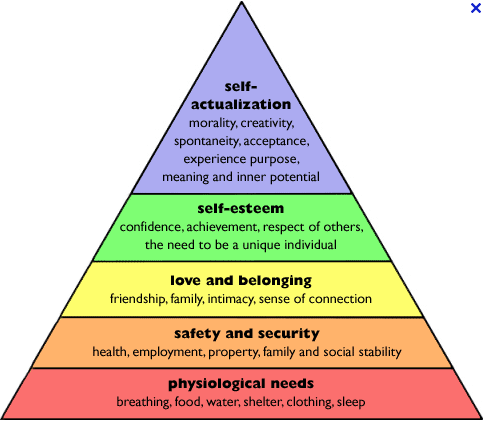 I will refer to Maslow’s hierarchy of needs to evaluate each space based upon psychological, safety, belonging and esteem. I am leaving out the upper-most need, (self-actualization) as it doesn’t relate to this study. If you’re working on the last need, then that is a success. Psychological needs are the most important as they make up the base of Maslow’s pyramid. The psychological needs that relate to office design are light and sound. The safety level of Maslow’s pyramid creates security of place, property and employment. People often feel like their offices are their own space, and in many respects, they are. Nesting in offices is common by workers putting up pictures and decorating. Safety of employment is shown in someone’s ability to be productive in their environment. The third level is love, belonging and social needs. Offices often create long lasting friendships, and regardless if that is a particular person’s result, most offices do have a family type atmosphere to some extent. Working around 8 hours each day with our colleagues, it does feel like a company family. The final evaluation point on Maslow’s hierarchy is Esteem. Yes, I capitalized that for a reason. People love to feel good about themselves, and pride is often closely related to ones career. I have never met a president of a company that didn’t enjoy the respect they were given by their position or a colleague who didn’t feel achievement in a career advancement. I will look at how a particular office design encourages and/or discourages esteem. Those are the rules for the analysis, let’s compare two conversely different types of office environments, open office and private, higher-walled offices. The open office is the trendiest design currently. The designs from office furniture manufacturers are beautiful and dynamic. Open offices can maximize on the coveted office daylight throughout a space. I remember moving from a west facing cubicle in an open office, to an east facing one and being excited to see the sun rise each morning. Seeing the sun set at work doesn’t have the same effect. There is not a more coveted desk in office position than being close to a window. Sound however, can be an issue in an open office. I don’t know a lot of people who like distractions while concentrating. I am a hunter personality, so I notice everything happening in a room. Yes, I notice when someone’s phone rings and also when colleagues clip fingernails. I’m talking to you male architects. Employees often wear headphones in open offices to have the ability to concentrate, however wearing headphones in more conservative offices can look unprofessional. Open offices are also the worst of the two types of offices for the ability to nest. No one wants to sit two feet across from a collection of Las Vegas coffee mugs, even though the owner may find comfort in looking at them. These sort of workplace nesting anomalies should definitely be curbed if considering an open office. While personal space can feel invaded in an open office, the social aspect is great. If you’ve never shot a rubber band at a colleague or pranked a co-worker, then you’re not having enough fun at work. Every office needs a bit of fun among the often stressful hours that engage most workplaces. In open offices, there is also the ability to easily collaborate and share in company knowledge. I was very fortunate in one open office location that I sat next to the technical lead of the architecture firm. Being able to easily ask him questions gave me a greater understanding of construct-ability. Open offices are also amazing for groups working on large projects. In running a business, it’s important to keep your best workers, and it is important for those employees to feel important. With an open environment, the main considerations showing worker importance are office size and location. Obviously, there are some positions which require privacy like HR, accounting and executive management. However, many employees can feel lost in a sea of people in a cubicle environment. Now I will discuss the old and tired high wall offices. I don’t believe any of us envisioned our lives as walking through a sea of gray cubicle walls, locating our cube and progressing to work diligently for the next 8 hours until the 5 o’clock bell rang. High offices throughout a space prevent day-lighting from fully penetrating most desk areas. While there are many day-lighting techniques, they cannot replace the ability to look out a window, to know when it’s raining or snowing, overcast or sunny, without leaving your desk. The noise in more private offices is minimal compared to open offices. Workers can have private conversations, and this is important not only for the person wishing to be private, but also the people who don’t want to listen to co-workers private affairs. In private offices, neighbors aren’t as subjected to cubicle decorations of co-workers and have the ability to concentrate on difficult or tedious tasks is maximized. When working in private offices, workers don’t form relationships as quickly as those formed in an open office. Newer employees in offices may feel secluded from the office camaraderie. Relationships in a company structure are important. Entry-level employees need to be able to easily download information from senior members to provide company consistency and growth. In private offices, it’s easier for employees to feel special. This helps keep key employees happy. So what will create positive work environment for your company? From this very scientific study, I have concluded that the best office space is one that lets the employee have the ability to work in daylight, minimize sound, create a space of their own, be productive, form relationships, download information from senior team members, and feel important in their position as an employee moving up through a company. My recommendation is to create private round tables (departments) where senior members have more private, higher walled offices while more junior or collaborative members of staff have open offices in the center. The windows should be located to maximize the number of workers daylight reaches. Senior members of your staff should be able to concentrate and have private conversations. Private office space should be available to office employees that need to work without interruption. Is it possible for office furniture manufacturers to make vertically convertible cubicle walls for those times when greater concentration is needed? Guidelines should also be made for office decoration. I’d love to hear your personal experiences/perspective on office design. This is a study based on Maslow’s heirarchy of needs and not a comprehensive study of office spaces.